Here in BC’s interior we have quite a few hot-spring options to choose from. Because all of them have soaking in mineral-rich, naturally warmed spring water in common, there are a couple distinct factors that come into play in deciding where you might want to go. Here, on the site, we have reviewed Halcyon Hot Springs. Though we haven’t reviewed any other ‘springs at press time, we’ve been to a few and understand that they all offer different things for different people. My travelling companion and I adapt well to just about anything offered. We are that happy to be on an away game. Though we like soaking in hot springs, we aren’t what I’d call power soakers. Neither of us has any interest in spending an entire day submerged in a bath of hot water—regardless of its healing properties. All this to say, if we are spending a weekend at a hot spring, it’s always good news when there is other stuff to do. 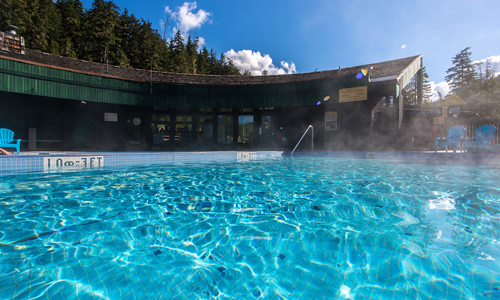 The Nakusp Hot Springs and Cedar Chalet delivered on this front—big time. We were there in late spring so our out-the-door options were hiking and biking. My partner was recovering from a knee injury so we were looking for something pretty mellow to ride on our mountain bikes. We thought the Kuskanax/Hot Springs Trail sounded perfect so we went up to the trailhead—just across a lovely covered bridge near the main office/poolhouse. The trail was a little uneven for a blown-out knee so, though we enjoyed the approach, we decided to look for something a little milder. If I go back there, I’m super keep to try this route. You can download the brochure for the Kuskanax/Hot Springs Trail here if you’d like to learn more. The Kimbol Lake Trail shares the same access point. With some grades approaching 40%, it looks to be a little more challenging but you end up at Kimbol Lake if you want to have a dip. Note that you can hike either of these trails. If you don’t have a bike of would rather take it a little slower, it’s a viable option. We wound up backtracking east down Hot Spring road and looping back along what are x-country ski trails in times of snow. It was a great 2-or-so hour ride on a gentle grade. Nakusp Hot Spring visitors can spend a couple hours up there or, as we did, stay for a couple nights. There are camping options, which look pretty nice, down by the Kuskanax Creek. 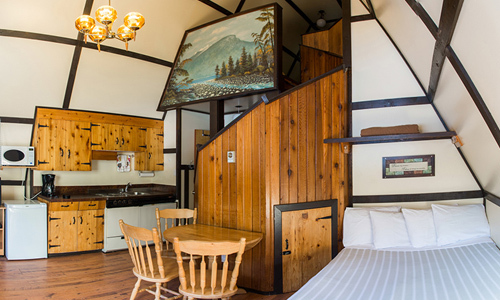 We didn’t want to fuss with camping gear so we stayed in the front suite of one of the four A-frame type chalets. 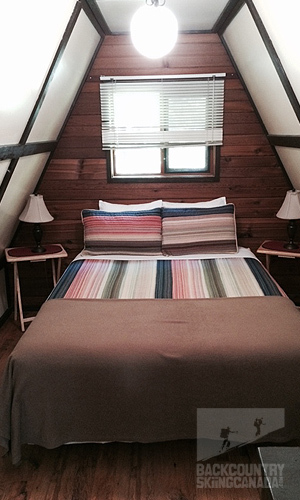 The chalets are comfortable and fully equipped. There are no restaurants on the grounds so we brought enough food to keep us happy. Note that there are BBQs for use between the first couple of chalets. We used one to cook up a couple steaks—the ‘Q was clean and worked perfectly. Unlike Halcyon Hot Springs, which caters more to the more swanky, heli-ski crowd, lodging at the Cedar Chalets is pretty basic. Everything is provided that you need and its very comfortable; there just aren’t any granite counter-tops or Jacuzzis. And that’s OK.
Here’s an interior shot of the front suite. One queen bed downstairs, one upstairs. Small fridge, nuker, over/stove. All you need in the kitchen. Here’s the upstairs loft bedroom. A cool space. Though, in the mid-summer heat, I’ll bet you the space is a little hot. 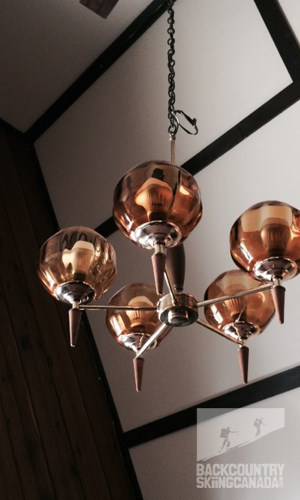 ‘just had to take a snap of the light fixture. 70’s much? I like it. Here’s Chalet #2’s exterior. Bikes at the ready. Small front porch for hangin’. Here’s a shot of the pools. I think this was just after the biggish group arrived. It wasn’t anywhere near as crowded as this most of the time we were there. 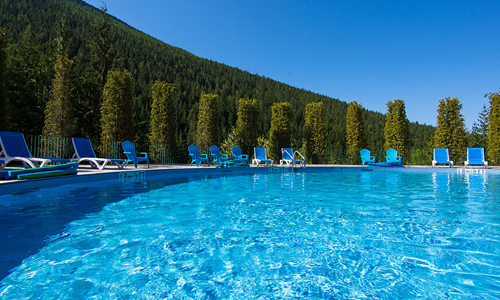 We weren’t permitted to take photos of the pool when outside (which I respect) so these were purloined from the Nakusp Hot Springs site. The first one is looking west in the direction of the Town of Nakusp, and the second is looking east toward the Goat Range. There are no high peaks visible from the pools but we saw many nearby when we were on our bikes. The pool house and change rooms are in this cool semi-circular building that “cups” the pool. It’s aesthetically pleasing and in tune with the 70’s feel. Kinda kitschy—in a totally positive way. 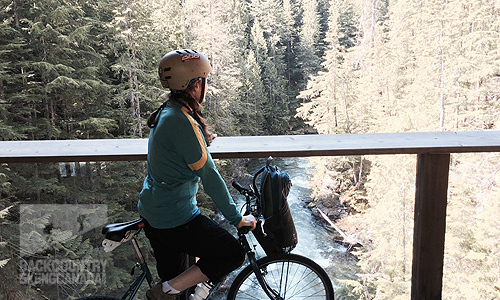 Here is my travel and life companion looking down on Kuskanax Creek from the covered bridge near the Hot Spring Trail trailhead. Kuskanax Creek is a part of the whole experience. It seems like wherever we were, we could either see or hear it. 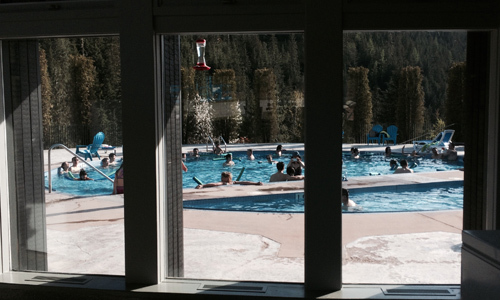 I give Nakusp Hot Springs (and the Cedar Chalets) two thumbs up. The overall vibe is a little more rustic and relaxed than some of the other ‘springs in the neighbourhood. Again, though, it depends on what you are after. Different strokes for different folks, eh? Generally, the atmosphere is uncrowded and has a “locals” feel to it. There was one surge of folks to the pool when we were there, but they didn’t stay long. The chalet’s 70s flashback aesthetic was OK by me—charming even. The interiors were clean and were in no way beaten up. The artwork and light fixtures were cool too. The chalets weren’t trying to be something that they weren’t. Check them out and you’ll know what I mean; the word authentic may apply. The fact that the ‘springs are at the end of a long road in the middle of nowhere gives you the feeling of getting away from it all, into the wilderness. The other ‘springs in the area are lovely but a little closer to HWY 23 and the accompanying vehicular noise. The fact that there’s a lot of other stuff to do here is also a bonus. If you are a “power soaker” this may not be an issue. If you like to mix it up and vary your activities, you can do that here. We were at the Nakusp Hot Springs at the end of the spring so there wasn’t much backcountry skiing to be had. Mid-winter, I have a feeling it’d be a backcountry skiing heaven. From what I can tell, locals are pretty guarded when it comes to sharing their stash—and I respect that. Suffice it to say that there are many options nearby including huts, alpine, trees, etc. And it’s all possible using the Nakusp Hot Springs as a staging zone. It’s no wonder so many hut and heli operations stage nearby. If you are up for an adventure, head up to the ‘springs when there’s snow on the ground and see what you discover. Bring your boards. 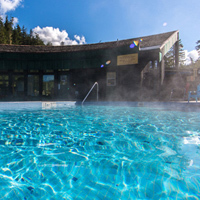 You could even work out a visit to Nakusp Hot Springs on your way to or from Rogers Pass. 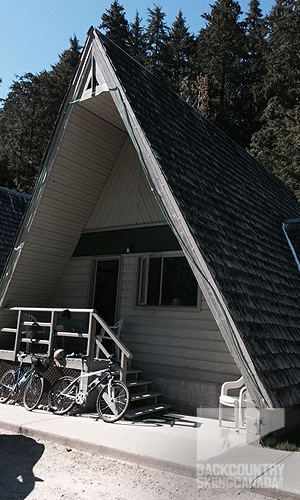 For info on the various chalet spaces available, go to the Nakusp Hot Springs site. This is only our opinion. Do you disagree? Did we miss something? Are we totally out to lunch? Join the discussion in the forums here, and let us know what you think. People like/dislike accommodations for different reasons so chime in and we'll get a well-rounded evaluation.